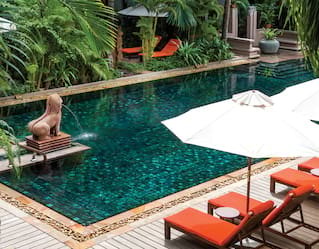 Staying with us turns a trip to Siem Reap into an unforgettably unique escape. Here are just some of the features that make us stand out from the crowd. 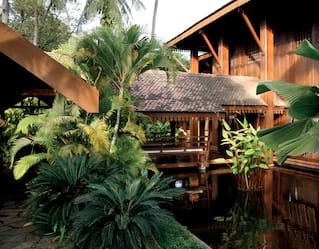 The hotel's swimming pool is surrounded by lush foliage to provide a private, intimate space. It’s a serene spot for a cooling dip after a day exploring the temples. Alternatively, relax in a lounger, order a cocktail, and while away the hours as you soak up the sun. Our idyllic retreat may feel like a world away, but we have everything you need to maintain your exercise routine. Visit our fully equipped fitness centre, featuring free weights and top of the line cardio-vascular training machines. Belmond La Résidence d'Angkor has two boutiques, selling silver and silk creations, clothing, Khmer artefacts and larger objets d’art. Pick up a beautiful keepsake to remind yourself of your Cambodian adventure, or find the perfect souvenir for family and friends back home. We offer a range of amenities and services perfect for your little ones, from board games and babysitting services to specially tailored dishes in our restaurants.